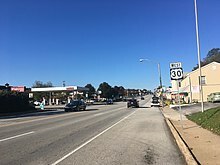 U.S. Highway 30 (US-30) is an east–west main route of the system of United States Numbered Highways, with the highway traveling across the northern tier of the country. It is the third longest U.S. highway, after U.S. Route 20 and U.S. Route 6. The western end of the highway is at Astoria, Oregon; the eastern end is in Atlantic City, New Jersey. Despite long stretches of parallel and concurrent Interstate Highways, it has not been decommissioned unlike other long haul routes such as U.S. Route 66. Much of the historic Lincoln Highway, the first road across America (from New York City to San Francisco), became part of US-30; it is still known by that name in many areas. Upon entering Idaho, US 30 runs along its old surface route through Fruitland and New Plymouth before joining I-84. It leaves at Bliss and soon crosses the Snake River, running south of it through Twin Falls and Burley before crossing it again and rejoining I-84. At the split with Interstate 86, US 30 continues east with I-86 almost to its end at Pocatello. US 30 cuts southeast through downtown Pocatello to Interstate 15, where it heads south to McCammon. There it exits and heads east and southeast, not parallel to an Interstate for the first time since Portland, into Wyoming. Unlike the three states to the west, Nebraska keeps US 30 completely separate from its parallel Interstates (Interstate 80 in this case). From the state line to Grand Island, US 30 closely parallels I-80. East of Grand Island, US 30 diverges from I-80 and runs northeast towards Columbus on a highway parallel to the Platte River. At Columbus, it turns east towards Schuyler and Fremont and crosses the Missouri River into Iowa east of Blair. US 30 crosses Iowa from west to east approximately 20 miles (32 km) north of Interstate 80. Between Missouri Valley and Denison, the highway runs in a southwest-to-northeast direction. Several freeway bypasses have been built around the major cities on US 30 - Ames, Marshalltown, Tama, Cedar Rapids and DeWitt. It crosses the Mississippi River into Illinois on the Gateway Bridge at Clinton. U.S. Route 30S and U.S. Route 30A are two previous alternate alignments of U.S. Route 30 in Iowa. They followed the original alignment of US 30 in Iowa. They both began in Nebraska, entered Iowa in Council Bluffs, and extended north to Missouri Valley via Crescent to meet the current highway. US 30 heads east in Illinois to Rock Falls, where it begins to parallel Interstate 88. At Aurora it turns southeast to Joliet, where it is a major thoroughfare in the city of Joliet (Plainfield Road), and then back east through New Lenox, Frankfort, Mokena, Matteson, Olympia Fields, Chicago Heights, Ford Heights, and Lynwood to the Indiana state line, bypassing Chicago to the south. The original 1926 routing of US 30 ran directly through downtown Chicago, however. US 30 in Indiana is a major rural divided highway. It is not a freeway except at Fort Wayne, where it runs around the north side on Interstate 69 and Interstate 469. Between I-65 (at Merrillville) and I-69 (Fort Wayne), there are over 40 traffic signals on this divided highway, hindering smooth traffic flow. This is especially pronounced near Warsaw and Columbia City, where the speed limit is reduced and there are many driveways from businesses, as well as traffic signals that are too near each other and poorly timed, causing frequent bottlenecks. Warsaw's Mayor, Joe Thallemer, has caused most of the bottleneck by continuing to allow new signal lights to pop up on US 30 during his tenure in office. (Note: This is an opinion not an objective fact. ) Many of the other signals are concentrated between Hobart and Valparaiso, the two cities being about 20 miles apart. It is, however, a four lane divided road through its entirety within Indiana, generally avoiding small towns. Speed limits range, but are generally 60 miles per hour (97 km/h). US 30 heads east across northern Ohio via Mansfield and Canton. After several upgrades, it is now a four-lane divided highway from the Indiana state line to Canton with controlled-access freeway sections between Van Wert and Delphos, Bucyrus and Canton, Ohio. At Upper Sandusky, the highway runs concurrent with US 23. After Canton, the road continues on to East Liverpool primarily as two-lane highway (until, near the unincorporated community of West Point, it joins southbound OH 11). US 30 spends only about 4 miles (6.4 km) in West Virginia. It crosses the Ohio River over the Jennings Randolph Bridge, continuing the freeway from the Ohio section. After cutting through the town of Chester with only one interchange, WV 2 (Carolina Avenue), the freeway section ends not too long after. US 30 continues across the northernmost piece of the Northern Panhandle on a two-lane road. US 30 heads southeast into Pennsylvania, joining U.S. Route 22 and then the Penn-Lincoln Parkway West west of Pittsburgh. It heads through downtown Pittsburgh on Interstate 376/US 22, leaving at Wilkinsburg for its own alignment. From there it roughly parallels the Pennsylvania Turnpike (Interstate 76) to the Philadelphia area, though in many areas, particularly from York past Lancaster, and bypassing Coatesville, Downingtown, and Exton, it is far enough from the Turnpike to require its own freeway. As it approaches Philadelphia, US 30 constitutes the main road of the "Main Line", a famous string of affluent suburbs west of the city; often called Lancaster Ave. and Lancaster Pike through this stretch. US 30 then briefly joins I-76 near downtown Philadelphia, splitting onto Interstate 676 to cross the Delaware River on the Benjamin Franklin Bridge. US 30 splits from I-676 just east of the Ben Franklin Bridge toll plaza in Camden and heads southeast to Atlantic City, generally parallel to the Atlantic City Expressway, passing through the New Jersey Pine Barrens. For most of its New Jersey run, it is known as the White Horse Pike. It ends in Atlantic City at Atlantic Avenue, about 1/2 mile (0.75 km) from the Atlantic Ocean. US 30 was originally proposed to run from Salt Lake City, Utah to Atlantic City, New Jersey. West of Philadelphia, Pennsylvania, this was designated largely along the Lincoln Highway, as part of a promise to the Lincoln Highway Association to assign a single number to their road as much as possible. West of Salt Lake City, U.S. Route 40 continued to San Francisco, California, although it ran farther north than the Lincoln Highway east of Wadsworth, Nevada and west of Sacramento, California. Around 1931, a split in Ohio was designated, from Delphos east to Mansfield. The original US 30 was assigned U.S. Route 30S, and a straighter route became U.S. Route 30N. US 30S was eliminated ca 1975, putting US 30 on former US 30N. US 30 was rerouted ca 1931 to bypass Omaha, Nebraska and Council Bluffs, Iowa to the north. The former route, from Fremont, Nebraska to Missouri Valley, Iowa, was designated U.S. Route 30S. Around 1934 it was truncated to Omaha and c. 1939 it was changed from US 30S to US 30A and was removed from service in 1969 when the historic Douglas Street bridge was demolished. Metropolitan Portland has a signed US 30 "Bypass", beginning at the St. John's bridge, following (roughly) Lombard Street in North Portland, continuing along Sandy Blvd., and rejoining the I-84/US-30 route in the center of the town of Wood Village. 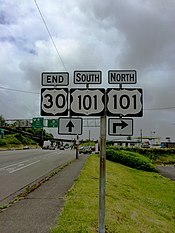 Junctions with I-5, US-30 at the St. John's bridge, and I-205 are all signed with "US-30 BYPASS" markers. Portland also had a U.S. 30 Business route along N.E. Sandy Boulevard, however the route was decommissioned in 2007. During the planning stages US 30 was proposed to run through and terminate in Salt Lake City, but Idaho and Oregon objected. What is now US 30 through those states (west of Burley, Idaho) had been designated as part of U.S. Route 20, another transcontinental route, but it took a detour to the north through Yellowstone National Park, making it inaccessible during the winter season. The states agreed to take US 30 along that route, splitting from the route to Salt Lake City at Granger, Wyoming and running along what had been designated as U.S. Route 530. (That number was then reused for the spur towards Salt Lake City.) The planned US 530 had ended at U.S. Route 91 at McCammon, Idaho, where the new US 30 turned north to Pocatello, meeting the planned US 20. (US 20 was truncated to Yellowstone but later extended along its own route to the Pacific Ocean.) What had been designated as U.S. Route 630, from US 30 at Echo, Utah to Ogden, was to be extended east on former US 30 to US 30 at Granger and northwest on US 91 and what had been designated U.S. Route 191 to US 30 at Burley. Utah objected to that plan, however, as it removed US 30 from that state, giving them only US 630, a branch. A compromise was reached, in which the US 630 route would become the main line of US 30, once improved to higher standards, but that was still not deemed completely satisfactory. Ultimately, in the final system, a split was approved between Burley, Idaho and Granger, Wyoming, with U.S. Route 30N running along the modern routing US 30, and U.S. Route 30S taking the route through Utah (planned as US 630). In the final plan (dated November 11, 1926), the route towards Salt Lake City became U.S. Route 530, ending at U.S. Route 40 at Kimball Junction, Utah. In 1988 Pennsylvania Department of Transportation (PennDOT) engineers proposed that U.S. Route 30 be rerouted and upgraded to a four-lane controlled-access expressway through a portion of Lancaster County. The American Farmland Trust (AFT) opposed the plan because, according to Jim Riggle, then Director of Operations at AFT, it "would have cut right through the heart of the best farmland [and] would probably have been the death knell of the Amish community." The plans were averted when more than a thousand Old Order Amish, people who do not usually participate in the public process, "drove their buggies to the meeting hall and expressed their concern by simply sitting quietly in the audience in their black homespun suits." I‑5 / I‑405 in Portland. I-5/US 30 travel concurrently through the city. I‑5 / I‑84 in Portland. I-84/US 30 travel concurrently to Cascade Locks. I‑84 in Cascade Locks. The highways travel concurrently to Hood River. I‑84 in Hood River. The highways travel concurrently to Mosier. US 197 in The Dalles. The highways travel concurrently through the city. I‑84 / US 197 in The Dalles. I-84/US 30 travel concurrently to Pendleton. US 395 in Stanfield. The highways travel concurrently to Pendleton. I‑84 in Gopher Flats. The highways travel concurrently to La Grande. I‑84 southeast of La Grande. The highways travel concurrently to North Powder. I‑84 in Baker City. The highways travel concurrently to south of Fruitland, Idaho. I‑84 / US 95 south of Fruitland. US 30/US 95 travel concurrently to Palisades Corner. I‑84 south of New Plymouth. The highways travel concurrently to west-northwest of Bliss. US 20 / US 26 north of Caldwell. The highways travel concurrently to Caldwell. US 20 / US 26 in Boise. US 20/US 30 travel concurrently to Mountain Home. US 26/US 30 travel concurrently to west-northwest of Bliss. US 93 east of Filer. The highways travel concurrently to Twin Falls. I‑84 in Heyburn. The highways travel concurrently to northeast of Declo. I‑84 / I‑86 northeast of Declo. I-86/US 30 travel concurrently to west of Chubbuck. US 91 in Pocatello. The highways travel concurrently to northwest of McCammon. I‑15 in Pocatello. The highways travel concurrently to northwest of McCammon. US 89 in Montpelier. The highways travel concurrently through the city. I‑80 in Little America. The highways travel concurrently to south-southeast of Walcott. US 287 east of Rawlins. The highways travel concurrently to Laramie. I‑80 southeast of Laramie. The highways travel concurrently to southwest of Cheyenne. I‑80 east-northeast of Cheyenne. The highways travel concurrently to Pine Bluffs. US 385 in Sidney. The highways travel concurrently to Chappell. US 26 west-southwest of Ogallala. The highways travel concurrently to Ogallala. US 81 south of Columbus. The highways travel concurrently to Columbus. US 77 / US 275 north of Fremont. US 30/US 275 travel concurrently to east-northeast of Fremont. US 75 in Blair. The highways travel concurrently through the city. US 59 in Denison. The highways travel concurrently through the city. US 169 on the Amaqua–Beaver township line. The highways travel concurrently to Ogden. US 218 in Fremont Township. The highways travel concurrently to Cedar Rapids. US 151 in Cedar Rapids. The highways travel concurrently to Bertram Township. US 61 in De Witt. The highways travel concurrently to southwest of De Witt. US 67 in Clinton. The highways travel concurrently through the city. US 34 in Oswego. The highways travel concurrently to Montgomery. US 33 in Fort Wayne. The highways travel concurrently through the city. I‑69 / US 33 in Fort Wayne. I-69/US 30 travel concurrently through the city. I‑469 north-northeast of Fort Wayne. The highways travel concurrently to New Haven. US 24 northeast of New Haven. The highways travel concurrently to New Haven. US 224 in Pleasant Township. The highways travel concurrently to Van Wert. US 23 in Salem Township. The highways travel concurrently to Crane Township. US 250 in Plain Township. The highways travel concurrently to Wooster Township. US 62 in Massillon. The highways travel concurrently to Canton. US 22 in North Fayette Township. The highways travel concurrently to Wilkinsburg. I‑376 in Robinson Township. The highways travel concurrently to Wilkinsburg. US 19 in Pittsburgh. The highways travel concurrently approximately 1 mile (1.6 km). I‑70 in Breezewood. The highways travel concurrently through the town. US 222 in Manheim Township. The highways travel concurrently through the township. I‑76 in Philadelphia. The highways travel concurrently through the city. I‑76 / I‑676 in Philadelphia. I-676/US 30 travel concurrently to Camden, New Jersey. US 130 in Pennsauken Township. The highways travel concurrently to Collingswood. ^ "Nebraska Roads: US 30". Retrieved 9 October 2014. ^ "Indiana Highway Ends - US 30". Archived from the original on 8 October 2012. Retrieved 9 October 2014. ^ "Pennsylvania Highways: US 30". Retrieved 9 October 2014. ^ Hiss, Tony (1990). The Experience of Place. New York: Alfred A. Knopf. pp. 173–174. ISBN 0-394-56849-4. This page was last edited on 22 April 2019, at 21:27 (UTC).